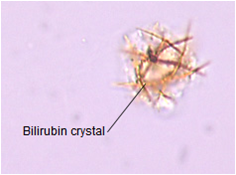 Bilirubin crystals are abnormal crystals in urine. Appearance: Yellow-brown needles or granules. They are frequently attached to the surface of cells. Bilirubin crystals are seen in several hepatic disorders. 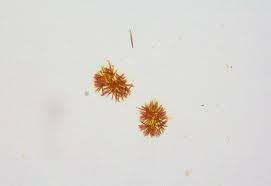 The appearance of bilirubin crystals should be accompanied by a positive biochemical test for bilirubin.